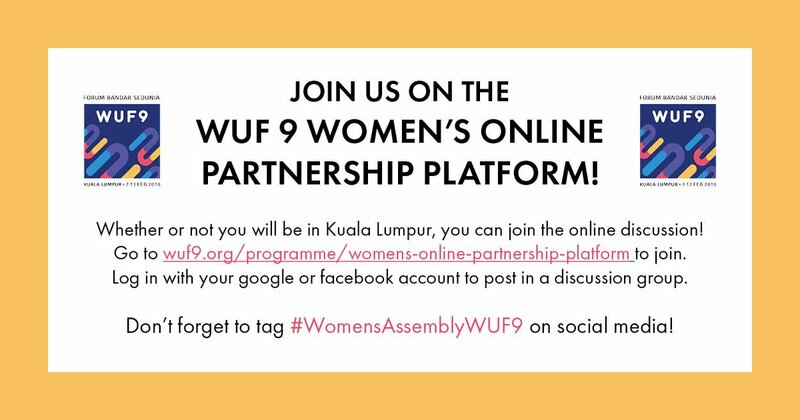 We invite you to participate in the Women’s Assembly at Women’s Online Partnership Platform! You can access it here. The Women’s Assembly at the World Urban Forum is a key meeting point for groups working to build sustainable, gender responsive and inclusive cities. At the Habitat III Conference, the Women’s Assembly was an important venue for the exchange of knowledge, tools, and partnerships to discuss the engendering of the New Urban Agenda. Since the adoption of the New Urban Agenda, this upcoming Women’s Assembly at the Ninth session of the World Urban Forum (WUF9) will be an essential meeting place in the continuing process of implementing the New Urban Agenda and all Sustainable Development Goals, particularly 5 and 11. Whereas the last Women’s Assembly culminated in a set of thematic commitments on behalf of attendees, the upcoming Women’s Assembly serves as a space to share and report on the localized implementation of the New Urban Agenda as well as lessons learned. It will also serve as an opportunity for sharing tools and addressing areas that need more inputs on gender equality and women’s empowerment in implementing the New Urban Agenda. The Women’s Assembly is a site for continued collaborative work on the global level as well as the grassroots level. It is designed to build a platform for the women’s constituency to share their experiences and perspectives, aiming to create1 an overall mechanism for engaging women in the creation of citizenship and the strengthening of urban governance for advancing the New Urban Agenda. The Assembly was created to acknowledge, celebrate, share, replicate and improve the achievements of the Women and Human Settlements movement in championing the sustainable inclusion of women in urban development. Alongside the New Urban Agenda, the 2030 Agenda, the Sendai Framework on Disaster Risk Prevention and Reduction, the Paris Agreement on Environmental Protection, and the Addis Ababa Agenda for Financing for Development, which establish the ways for achieving the Sustainable Development Objectives of Agenda 2030, the Assembly provides an important platform to advocate for gender equality and women’s empowerment in all aspects of urban development, thus ensuring the inclusion of women’s unique needs and priorities, and recognizing the important leadership roles they play in implementation. Further highlighting the use of women’s experiences to shape appropriate and effective solutions will promote sustainable urban development. Promoting participation, dialogue and engagement, the Assembly will hold six (6) training sessions as well as two (2) plenary sessions, further emphasizing the institutionalization of gender-mainstreaming and women’s empowerment activities. The Assembly will conclude with the consolidation of participants’ recommendations and commitments, and the sharing of tools and methodologies to ensure the objectives of the New Urban Agenda will be implemented in an empowerment-focused and gender-responsive manner, based on the principle of substantive equality. The Women’s Assembly is thus an important, pivotal meeting point to discuss the progress of and plan the implementation of engendering the New Urban Agenda. This site for the exchange and sharing of knowledge and the transfer of tools is essential to implement the New Urban Agenda.